Please put on your to-do list and PARTICIPATE in this effort. As of Friday, June 26th, there were well over 100 drafts of open government recommendations that you, the public, had written in Phase III of the public consultation process. The community of contributors grows by the hour, as word of this collaborative effort spreads. A number of you have told us that there is great excitement about the drafting process in your communities, but that it has taken time to raise awareness about this important effort. We’ve heard you and have decided to extend the time period for drafting and voting. Drafting of recommendations will now continue through 11:59pm Eastern Friday, July 3rd. Voting will stay open through the holiday weekend, until 11:59pm Eastern Monday, July 6th. Spread the word and join the movement to help make government more transparent, participatory, and collaborative. 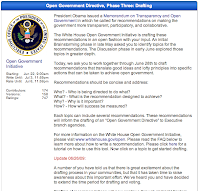 Write, read, and rate recommendations at http://www.mixedink.com/opengov/ --Read the post on the White House blog. Collaboration- including inter-governmental collaboration, public-private partnerships, online dispute resolution. Don't see what you think is important? Jump in. The White House is using a tool called Mixed Ink for the collaboration. It's a hybrid wiki that lets multiple authors update and comment, and also enables voting on changes for what they call "more consensual collaboration." Don't be daunted by the tool. Poke around. Vote. Then go ahead and make some changes or add a section. Especially if this is what you have been asking for, and, let others know about this opportunity. This will be as good as we make it. P&G and Nielsen are trying to understand how learning gleaned from “listening” to online consumer conversations compares to survey-based findings (”asking”). What we learned was surprising and important. Findings from “listening” and “asking” were largely consistent. 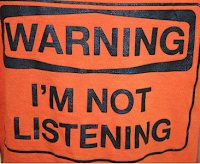 Most importantly, in every case, “listening” added to our understanding in important ways, meaningfully enhancing insights, and sometimes suggesting a different course of action. For example, a survey on cloth diapering identified cost savings and sustainability as key reasons for using cloth diapers. Listening took this further, revealing the passion cloth-diapering moms have for “CD’ing,” and connecting it to core values around parenting. This led to a fundamentally different, more holistic understanding of cloth diapering than was available from survey results alone. It's clear that asking is important. But, information from listening added to information from surveys (asking) gives a more nuanced and more complete picture of what's going on. For government, it means looking for ways to listen. Here are 7 easy--and available--listening tools. If you survey, be sure to leave space for free response. Yes, it's harder to quantify, but it's the best way to get to what your users/visitors really mean. Regularly review the emails sent to the generic webmaster address. You will learn what people are looking for, what makes them unhappy, and potential gaps in content or services. Review weblogs for search terms. These are the words and phrases that people are using to get to your site. Take the most popular terms and run the search yourself. What are the results? Is it what a user might expect? Review your internal search logs to find out what people are looking for once they're on your site. Quarterly, look at all the search terms and group them by "like." When you group them you might see a different trend. Also, your users will tell you what they call your content (you say "lawful permanent residence" and they say "green card"). Check out what people are looking for on Google. There is a suite of free query tools that can give you insights into the people who may or may not visit your site. Start at What is the Google zeitgeist? and work your way through the search and comparison tools. Take the terms people relate to you (in 3 and 4) and use twitter search. You will get folks' raw opinion. Some good, some bad. Save the search as an RSS feed for regular access. Look for other twitter monitoring tools. Sign up for Google Alerts. Enter the terms to track and find out what bloggers, news sources and others are saying. Got a good tool that you use? Put it in the comments and help a guy out. BTW, Nielsen and P+G are doing a webinar to discuss their findings on Friday at 2 pm. You can register here. It's Okay Not to Know-But How Will This Work? Web-design firms bidding on a contract to revamp the official stimulus-tracking site Recovery.gov face the challenge of building a prototype that must comply with unpredictable content requirements, according to procurement specialists and information access academics. It's great that the Board at Recovery.Gov is not creating a multi-volume set of requirements. In addition to lacking the time, the tortured requirements process is not a clear path to application success. But what is the path to success? A challenge in a project like this--especially when establishing a new work relationship--is to have client and vendor share the same expectations. I hope that the RFP includes clear and specific goals for the site. I hope that it defines what success is--for the END USER. This definition will provide the touchstone to develop and evaluate features, to set appropriate phases of implementation, and to pull the plug on efforts going astray. I hope that the project includes government program staff who are well-versed in the technology and who have the time to participate as partners, rather than observers. I hope, too, that their bosses trust them to do the work and make the decisions they need to make. I hope that the people working on the effort spend most time coding, iterating, sharing, fixing and coding, iterating, sharing, fixing and fewer resources on updating project management software. I hope that there is the courage to honestly say what's working and what's not, and to be able to say when a timeline is flawed or to jettison some one's pet feature in order to make the deadline. And, I hope that the project goals are reviewed in every meeting to keep everyone aligned with the big picture. 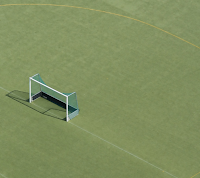 Did I say goals were critical to success? This is especially key when there are so many unknowns. 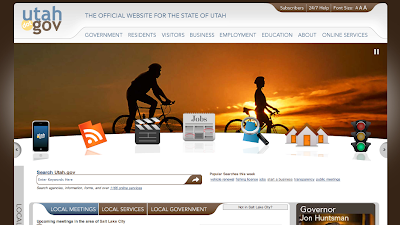 The State of Utah launched a new, visually stunning web portal. Ari Herzog gives a great overview on his blog. Suffice to say, Utah and its portalized front page is at the forefront of the digital revolution among the 50 states. The new layout blows the other states out of the water. From the press release on the new site, Utah CIO Steve Fletcher: "The new Utah.gov incorporates cutting edge technologies to enhance the user experience and the usability of the site. This site is ground-breaking in the effort to help citizens find information regardless of the level of government.”--Read and see more on AriWriter. The sophisticated design offers a number of attractive animations that lead visitors down various navigation paths. Have a look. Definitely sweet. So who wouldn't want to take it out on a test drive? For my test, I decided to take it on a dot-gov tour to complete three tasks: get a new drivers license, find out what I needed to do to start a business in Utah, and find eldercare information, specifically I was looking for evaluations of senior living options. New Drivers License. This is a common task so I figured it would be easy. I clicked the very nice top navigation item "Residents." It brilliantly and very usefully then exposed a series of options, "Citizens & Community" and right below that "Cars & Transportation." BINGO! Finding eldercare resources. People with aging parents know the challenges of accessing eldercare services--especially across state lines. I pretended my mom lived in Utah and went through the exercise of finding senior assisted living options in the state and learning about consumer and regulatory ratings of facilities. I went back to the main navigation at the top and clicked on Residents. My first scans missed the option "Seniors.utah.gov." It would have been easier to find if it said simply "Seniors." It was the only option in URL-speak. Every other navigation option was a clear heading. There is a reason that I don't like portals. They allow for silos and competing and overlapping content. There really is alot to like about the new Utah site, and I think it's a model for other state web sites. But, to be citizen-centric, it needs better integration and coordination of content. Utah has been a leader in morphing services into dot-gov, and I expect that they will be at the forefront in helping to resolve the "problem of the portal." Because as challenging as the completion of these tasks were on utah-dot-gov, they are harder and even impossible on other state sites. It's clear that they are focusing on top tasks, just need more work under the hood. Good job Utah, help lead the way. Mock not. As the regime shut down other forms of communication, Twitter survived. With some remarkable results. Those rooftop chants that were becoming deafening in Tehran? A few hours ago, this concept of resistance was spread by a twitter message. That a new information technology could be improvised for this purpose so swiftly is a sign of the times. It reveals in Iran what the Obama campaign revealed in the United States. You cannot stop people any longer. You cannot control them any longer. They can bypass your established media; they can broadcast to one another; they can organize as never before.--Read the entire post at The Atlantic. While it's too early to say what will happen, it's clear that people are using whatever conduits they find to communicate, especially during a crisis. At the same time the situation in Iran was unfolding, Crisis Camp was happening in Washington, D.C.
CrisisCamp DC started with one idea, "How can technology help people around the world during times and places of crisis?" Over the weekend about a hundred people got together to talk about how technology is or can be used for humanitarian relief. Industry, NGOs, responders, academics, public health, geek, non-geek and a few government joined to usher in a movement. 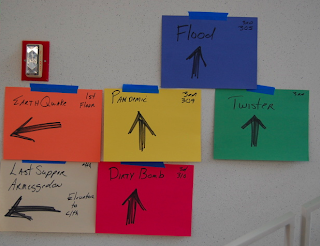 Where else can you find sessions like Flood, Earthquake, Pandemic, Twister, Dirty Bomb, Last Supper-Armageddon, or the use of zombies as an example to help people think in new ways? Government limits were also in the mix. Government can be slow, not willing to trust citizens as adults, hobbled by privacy and potential corruption, and too top-down when crisis is definitely felt and fought from the ground up (see Camp tweets for fuller flavor). A big theme was emphasis on listening rather then telling, adapting rather than knowing, and sharing. There has been discussion about authoritative sources for crisis information, and government is at the beginnings of understanding our role. We know what we know, but unofficial sources--real people--know what they are experiencing. Bringing these views and experiences together, with the help of smart smart people and technology, will define success and failure in future crisis. And, as everyone at Crisis Camp was well aware, on the ground this is real--survival and pace of recovery. See notes from some sessions here, and as your interest is piqued, join like-minded innovators at the Ning network for Crisis Camp. The hope is for the movement to go viral, with camps around the world working and sharing to best use technology in times of crisis. Check out this dot-gov video from down-under--Australia. Matthew Hodgson's video on Gov 2.0 shows that the challenges are trans-hemispheric [okay, I likely made that word up]. From PDF's and static pages created by the "experts" behind the green shades talking about themselves in arcane governtmentese to a landscape full of choice, relationships, trust, and community. Making government personal, real and relevant. Coming soon to a continent near you! 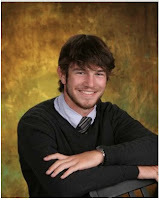 This weekend my son is graduating from high school. And, I can say--without bias--that he is a brilliant, talented, extraordinary young man. He sees the frustration of trying to do good work in government and asks, "Why do you do it, Mom?" But this isn't about me. It's about him, and making public service attractive to the best, the brightest, and the most talented--like him and his classmates. Not because government is a "secure" job, but because government is where good people go to do good work. Because government is where innovation is happening. Because government can help you change the world. Because public service is challenging and rewarding. What will it take to for Joe and his classmates to bring the future into government? As was said, we need more young people. Discuss. James Carafano, from the Heritage Foundation, writes that government's Web 2.0 efforts are lagging--especially regarding safeguarding and strengthening American society. While the White House as well as many federal agencies are experimenting with social networking tools, their efforts are unguided by sound research or clear and coherent policies that encourage innovation while protecting individual liberties and privacy. The hierarchical practices of traditional government are not keeping up; they are inadequate for exploiting the explosion of social networking systems. Much of what I have been tracking about security and social media has been about cyber-security. Here, Carafano asks us to take a look at using social media to protect our country, rather than simply as a threat to our security. And to do so in a systematic, deliberate way. This approach--understanding the way networks develop, improving the knowledge and skills of employees and fundamentally changing how government communicates--has to be accomplished while government continues to use the new tools. This practical, if imperfect, experience is driving the policy and the research agenda. Waiting for research and policy would squander the opportunity to build experience (and perhaps expertise) of government innovators and innovation. Both threads, deliberate change and raw experimentation, are needed to strengthen and protect our country as information creation and usage is being fundamentally restructured before our eyes.